For our money, the Apple Watch still ranks as the best smartwatch you can pick from the crop. And with the arrival of the Series 3, Cupertino's standing amongst the pack has been bolstered further. 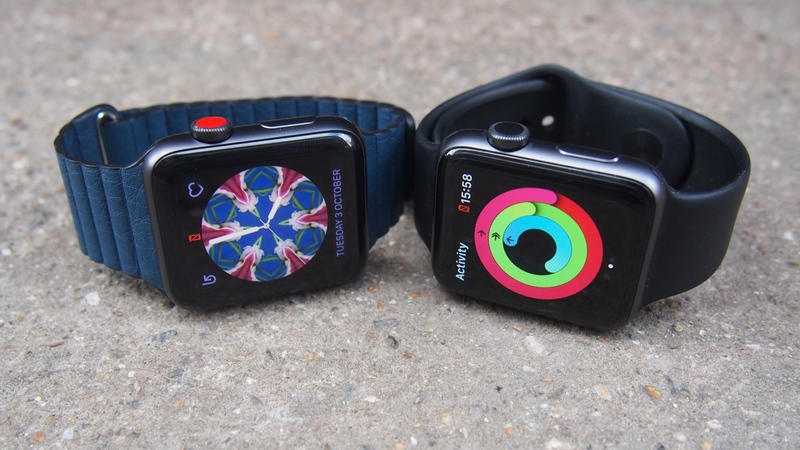 Although the Series 2 is no longer on sale after being muscled out by its newer sibling, there's now a decision to be made for those still rocking last year's Watch and that's whether they should upgrade to a Series 3. But just how do the devices differ when compared alongside one another? Well, below we'll break down the design, features, price and battery in order to give you an extended look at how the two match up. Whichever way you look at these two devices, there's little to separate them in terms of outward design. Apple is still rolling with the same square-face look, so the biggest talking point here is the introduction of a red patch on the Digital Crown to signify the Watch's leap into LTE. If you focus on the actual specs, it's almost an identical proposition, too. The Watch still comes in both 42mm and 38mm options, with the display on both devices a 1.65-inch AMOLED capacitive touchscreen with 390 x 312 pixels and around 303 ppi pixel density. Both variants of the two sizes all but match up, with one of the only points of difference the 0.4g difference in weight between the 42mm models and the 0.5g difference between the 38mm watches. The cellular version of the Series 3 also adds a minuscule 0.25mm (about two sheets of A4 paper) of chunkiness to the body. It's what's inside the Watch that's really changed between these two generations. With the introduction of LTE, Apple has added an eSIM under the hood, while still managing to keep the same design, and also included the new W2 chip, which it claims gives the Series 3 a 70% boost in raw performance over the Series 2. The pair both bring swimmers the same 50m waterproofing, meaning you're free to take a dip in the pool or take it in the shower. We should also make mention of the new colours Apple has introduced with the Series 3. Blush Gold and Ceramic Grey are now available through the latest generation, while Apple is also offering some new Nike+ models and Hermès bands. As you'll have gathered, though, this is pretty much the same form factor being dealt to users, and this similarity almost certainly played a part in the demise of the Series 2. So you're getting anything but a redesign between generations, but it's the features that are the biggest difference to consider. And when we say features, there's really just one in particular that you need to keep in mind – LTE. While the headline addition to the Series 2 was in-built GPS, the Series 3 brings cellular connectivity to the mix in order to let users take/make calls and receive notifications. You'll also be able to access Apple Music directly from the watch, meaning you can head out for a workout without your iPhone and still be able to stream tunes. Thankfully, you don't need to have a new phone number, either, as the Watch will share your current phone number with its built-in SIM. That's essentially the lowdown with LTE, but there's also one more key upgrade thrown into the mix, the barometric altimeter, which helps the Series 3 to track stairs climbed while helping you to close your activity rings. The pressure sensor makes tracking snowboarding and skiing possible, too. Aside from those additions, it's pretty much the same billing of features here. And with the Series 2 able to take advantage of all the same watchOS 4 nooks and crannies, such as improved heart rate metrics, an updated Workout app and revised menu screens, the differences are split even thinner. The Series 3 clearly has the edge thanks to its additional smarts below the surface, but that doesn't mean its killer feature, LTE, will appeal to everyone. Apple claims the new W2 chip inside the Series 3 is 50% more power efficient than the Series 2, although like always when discussing battery, this is still all relative to how you're using the device. And with LTE in the mix for the newer model, this will inevitably soak up power quicker. Apple says you can expect an hour of talk time through LTE and three hours of talk time when connected to an iPhone. Meanwhile, working out outdoors gets you four hours with LTE and GPS, five hours with GPS alone and 10 hours with neither. So it may technically be more efficient, but with the prospect of LTE and the same internal 279mAh battery, you're likely to receive a similar 18-hour battery life with both the Apple Watch Series 2 and Series 3. With the Series 2 now confined to the smartwatch graveyard, it's not even possible to make the frugal argument when comparing prices. Instead, you're left to mull over the options of the Series 3 (or head back to the now-retro days of the Series 1). If you don't care about the joys of LTE, Apple has a non-connected model, which begins at $329, otherwise you'll be paying at least $399 to roam wild and free. From there, a number of different options also affect your pricing. If you want the stainless steel or ceramic finish, as opposed to the standard aluminium, it's going to cost you from $599 and $1,299, respectively. There's also the special edition from Nike, which are priced alongside the standard models, and the Hermes collection, beginning at $1,149. Oh, and while we're talking money, don't forget that LTE-enabled Series 3 devices will also incur an additional monthly fee, too, which varies depending on your country and network. Which one wins the day? It's not that big of a stretch to say the Series 3 is a definite improvement on its predecessor and Apple's best smartwatch to date. Although it hasn't changed much from the Series 2 formula, the addition of LTE and performance upgrades will no doubt prove pivotal in either pulling in fresh users or seeing older owners pay for the full, untethered experience. But unless you're desperate to keep tabs on messages while leaving your phone at home, or have an insatiable urge to make calls from the wrist, we're not convinced that Series 2 owners will feel the value in upgrading. It's a lofty fee to pay for what can be broken down to an iterative feature update, and your money could best be saved for a more expansive upgrade next year.